"This is the way my mother always made her scalloped potatoes. The measurements are taken from other recipes because she always just winged it, but the method is the same. The key is to heat the milk first!" Spread about 1/3 of the potato slices into the bottom of the prepared baking dish. Top with about 1/3 of the onion slices. Sprinkle 3 tablespoons flour over the potato and onion. Arrange 2 tablespoons butter atop the flour. Season the entire layer with salt and pepper. Repeat layering twice more. Heat milk in a saucepan until warm. Pour enough warm milk over the mixture in the baking dish so the top of the liquid is level with the final layer of potatoes. Made it. The onions over powered it and it seemed a little too runny. Otherwise tasted ok.
janebp, this is my idea of scalloped potatoes. Other recipes call for so much cheese they become au gratin. This to me is a true scallop potato recipe. Very good! This is my mom's recipe too..she used to cover the dish with foil to speed up the cooking a little then take the foil off to allow browning. 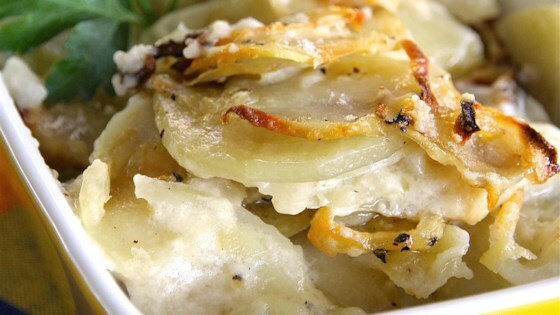 Oh my Gosh - this recipe is the way scalloped potatoes should taste. I made it for our New Year's Eve dinner with meatloaf and it was Wonderful! Thanks! !